In the match one of Indian Premier League 2019 (IPL 2019) Chennai Super Kings have won the toss and have opted to bowl first against Royal Challengers Bangalore. The match is being played at CSK’s home venue at the MA Chidambaram Stadium in Chennai. The IPL 2019 opens with MS Dhoni-led CSK taking on Virat Kohli’s RCB. You can follow live score updates of CSK vs RCB here. Both Super Kings and Royal Challengers will be looking to get off to a winning start. This is the 23rd meeting between these two sides. CSK leads the head-to-head record with 14 wins against RCB’s seven. One match between these two sides was abandoned due to rain. CSK boasts of a strong record at the MA Chidambaram Stadium, having won 34 and lost 14 matches. RCB, on the other hand, have managed to win only two out of eight matches at CSK’s home venue. Defending champions Super Kings apparently start as favourites. 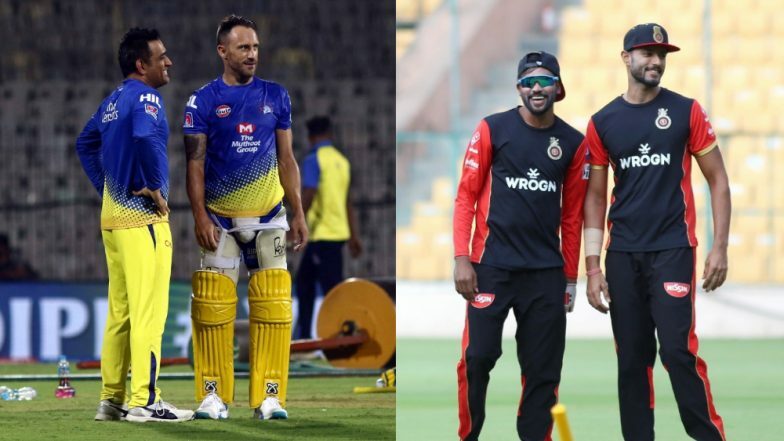 CSK vs RCB, IPL 2019 Live Cricket Streaming: Watch Free Telecast of Chennai Super Kings vs Royal Challengers Bangalore on Star Sports and Hotstar Online. Last season, in two matches between these two teams, CSK won emerged victorious in both the games. In the first meeting, CSK secured a five-wicket win and then followed it by a six-wicket win. Chennai Super Kings Playing XI: Shane Watson, Faf du Plessis, Suresh Raina, Ambati Rayudu, MS Dhoni, Kedar Jadhav, Dwayne Bravo, Ravindra Jadeja, Harbhajan Singh, Deepak Chahar, David Willey. Royal Challengers Bangalore Playing XI: Parthiv Patel(w), Virat Kohli(c), Moeen Ali, AB de Villiers, Shimron Hetmyer, Shivam Dube, Colin de Grandhomme, Umesh Yadav, Yuzvendra Chahal, Mohammed Siraj, Navdeep Saini.